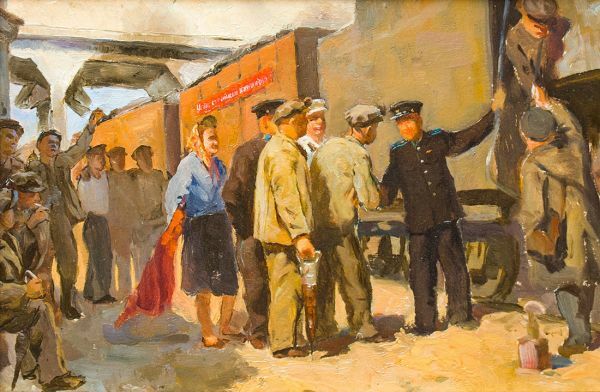 Buy works – Neyasov Vassily Andreevich | (1926, Mordovia ASSR – 1984, Chelyabinsk). Neyasov Vassily Andreevich (1926, Mordovia ASSR – 1984, Chelyabinsk). In 1941-1943 he worked as a decorator in the Mordovia Musical Drama Theater under the guidance of M.A. Zernin and B.I. Roslenko-Ridzenko. Apprentice of F.V. Sychkova. He studied at the Year 1905 Moscow Art Regional College, where M.G. Vainshtein, V.N. Baksheev, N.N. Nikonov were his teachers. Since 1951, he lived and worked in Cheliabinsk. He specialized in industrial (Mastering of a New Process; Coal for the Motherland), military (The Battle on the Izvoz Mountain diorama), and historical (In the White Army Rear) themes. He painted landscapes of Mordovia, the Urals, Middle Asia. His works were a permanent feature in regional, zonal, republican and All-Union Art Exhibitions. His one-man show was held in Cheliabinsk in 1984-1985. The artist’s works are in the Chelyabinsk Regional Picture Gallery, in fine art museums of the Urals’ cities. Portrait of the Old Believer. Study for the painting "Coal for the communism constructions". 75000 - 120000 rub. 75000 - 120000 rub.